Students should arrive to class no more than 5 to 10 minutes before it starts and should be picked up no more than 10 minutes after class ends. Notify the academy if you will be missing classes. 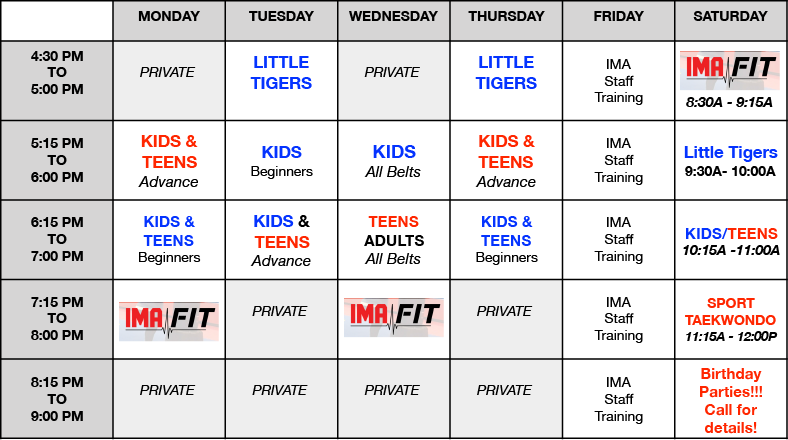 Students may only attend classes for their age and/or belt rank. Outside shoes are not allowed on mat. Please only wear your TKD shoes in the school. Please put your shoes and sparring bags on the shelves neatly. Food and Drink are not allowed on the mats. Not responsible for any belongings left in the school. Join our Remind App text notification group! Send a text to 81010 with the message @imaru.